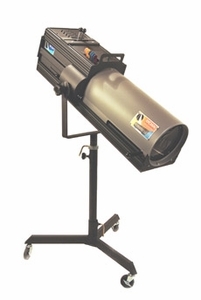 The 1239 Clubspot 7.5, utilizing a 750W GLD lamp as its light source is far brighter than the 1238 Super Clubspot it replaces and offers control conveniences versus the also now discontinued Midget II. The Clubspot 7.5 has a 3,200K color temperature and flicker free beam. Optics have been improved with the inclusion of condenser optics which yields a much flatter beam. Controls include a heavy-duty nichrome iris, horizontal trim shutters, and mechanical fader. An internal manual six color boomerang is included as well as gobo slot.